Passion, so the saying goes, trumps pedigree. Matt Gourlay, CGCS, is proof that it's possible to have both. Gourlay comes from long line of superintendents, that includes his father David Gourlay Jr., CGCS, and grandfather David Sr. and traces all the way back to . . . Old Tom Morris, whose second wife was a Gourlay and an ancestor of the contemporary Gourlay clan. But Matt Gourlay, director of golf at Colbert Hills in Manhattan, Kansas, for the past nine years, is more than a legacy superintendent. "He is so much more mature than other kids when he was growing up," said Gourlay's father, David Jr. "He always wanted to be a superintendent. I remember the first time he drove a Gator by himself; he was still in diapers. He drove it for a half-mile all by himself." It's not just Gourlay's father who sings his praises. so do Colbert Hills general manager Steve Lambert, the club's members and Kansas State University men's golf coach Grant Robbins, whose team calls the Jeff Brauer-Jim Colbert design home. 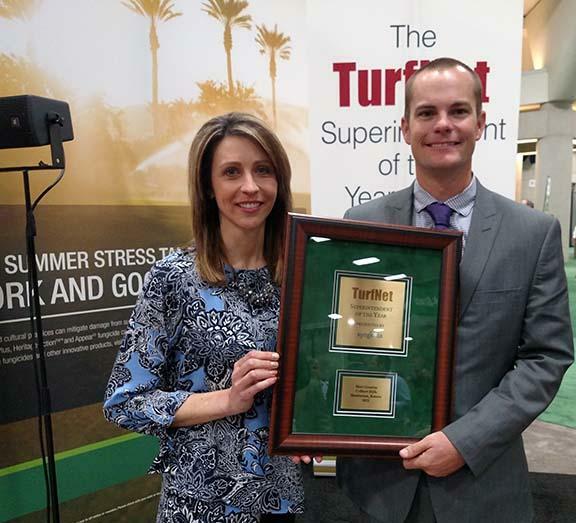 Their calls were heard on Feb. 11 when Gourlay was named the recipient of the 2015 TurfNet Superintendent of the Year Award, presented by Syngenta. Colbert Hills member Zac Burton, called Gourlay the lifeblood of the property who rose above a mountain of challenges in 2015. A maintenance budget that hasn't increased since 1999 would, in itself, be a source for concern. Not only has the Colbert Hills maintenance budget not increased in the past 16 years, it actually was cut in 2015 by one-fifth. "Matt's total maintenance budget was cut by 20 percent at the beginning of this year due to financial stresses on the course as a whole," Burton said. "On top of this budget cut, Manhattan, Kansas has been mired by drought like many other courses across the country. Matt chose to expand native grass areas around our links-style course and eliminate over 400 irrigation heads to reduce water expense. Our water costs were $40,000 under budget, and with more water directed to the most-played areas of the course our conditions have been better than ever. This native grass expansion also reduced mower hours, fuel cost and labor dollars." In the nine years he has been head superintendent at Colbert Hills, Gourlay has cut water use by 71 million gallons per year to 41 million gallons. At a current billable rate of $3,000 per 1 million gallons, the savings mount. "He loves making the course the best he can for the buck," Gourlay's father said. "He squeezes more blood from a stone than anyone I know." Besides his ties to Old Tom Morris, Gourlay has a legacy nearly as impressive as his passion for the job. His father was a superintendent at many courses throughout Canada before transitioning to the role of club manager, and his grandfather, a native of Scotland, was a superintendent for more than 50 years, a founding member of the Canadian Golf Course Superintendents Association and in 1987 was a winner of the GCSAA Col. John Morley Distinguished Service Award. The 30-year-old Gourlay was chosen from a field of six finalists by a 12-person judging panel from throughout the golf industry. 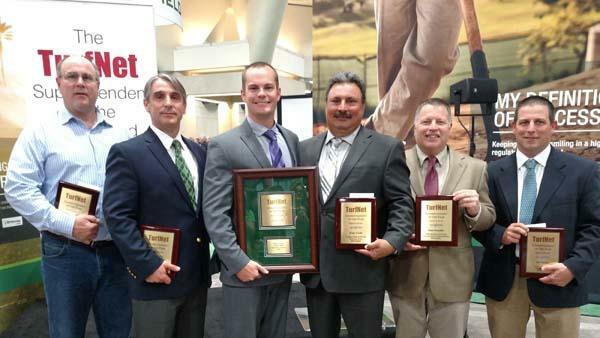 Other finalists were Bob Becker of Scioto Country Club in Columbus, Ohio, Marty Baumann of Anchorage Golf Course in Alaska, Jorge Croda of Southern Oaks Golf Club in Burleson, Texas, Matt Crowther, CGCS at Mink Meadows Golf Club in Vineyard Haven, Massachusetts and John Cunningham, CGCS at Bellerive Country Club in St. Louis. Gourlay receives a trip for two on the TurfNet members golf trip in October to Bandon Dunes Golf Resort in Oregon, courtesy of presenting sponsor Syngenta. Life at Colbert Hills, which gets much of its labor force from K-State students, means constantly training workers to get the job done today, and preparing them for the next phase of their careers. Sometimes, that might mean filling the same job three times in a calendar year. "Could you imagine, training someone how to cut greens, fix ball marks or rake bunkers three times in a year? I don't know if I would have the patience for that," said Gourlay's father, David Jr., general manager at Boca Grove Golf and Tennis Club in Florida. "He never complains. He's always looking for ways to make the golf course better." Previous winners include: Fred Gehrisch, Highlands Falls Country Club, Highlands, NC (2014); Chad Mark, Kirtland Country Club, Willoughby, OH (2013), Dan Meersman, Philadelphia Cricket Club (2012), Flourtown, PA; Paul Carter, The Bear Trace at Harrison Bay, Harrison, TN (2011); Thomas Bastis, The California Golf Club of San Francisco, South San Francisco, CA (2010); Anthony Williams, Stone Mountain (GA) Golf Club (2009); Sam MacKenzie, Olympia Fields (IL) Country Club (2008); John Zimmers, Oakmont (PA) Country Club (2007); Scott Ramsay, Golf Course at Yale University, New Haven, CT (2006); Mark Burchfield, Victoria Club, Riverside, CA (2005); Stuart Leventhal, Interlachen Country Club, Winter Park, FL (2004); Paul Voykin, Briarwood Country Club, Deerfield, IL (2003); Jeff Burgess, Seven Lakes Golf Course, Windsor, Ontario (2002); Kip Tyler, Salem Country Club, Peabody, MA (2001); Kent McCutcheon, Las Vegas (NV) Paiute Golf Resort (2000).